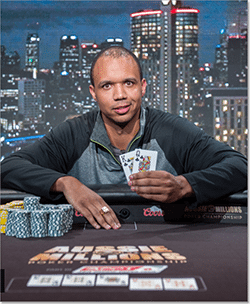 You might run into high rollers like Phil Ivey in the biggest online poker tournaments. The best online poker sites host hundreds of tournament tables every week. There’s something for everyone at trusted online poker operators like PokerStars, Full Tilt and 888Poker.com, so let’s take a look at the most popular competitions for real money poker players online. Our top-ranked Internet poker site runs a heap of lucrative regular tourneys and special events for players in the Asia Pacific region, many of which are scheduled for user-friendly AEST playing hours – sometimes a rare treat for online poker enthusiasts in this part of the world. The 888 Poker Mega Series runs every Sunday, sporting a variety of no limit hold’em (NLH) events to suit both the high-stakes poker players and those with less expansive bankrolls. $100,000 Mega Deep: Widely regarded as 888’s flagship tournament, the Mega Deep is a no limit hold’em event which features increased chip stacks (10,000) and longer blind levels (30 minutes). With a $215 buy-in and a guaranteed $100,000 prize pool, this one is for the serious players out there who like to grind it out. $50,000 Turbo Mega Deep: Another regular Sunday comp, the 888 Turbo Mega Deep follows its big brother’s lead in most aspects. But where the standard Mega Deep uses half-hour levels, this supercharged version ups the blinds every six minutes. $5000 Mega Knockout: Here, the buy-in of $209 covers much more than the guaranteed $5000 prize pool. For every player you dump out of the tournament, you win a bounty incentive of $100. Again, players start with 10,000 chips, while the blinds change every 10 minutes. $20,000 Mega Dozen: With 2000 spots available and a buy-in of just $12, the Mega Dozen is one of 888’s most popular and affordable Texas hold’em tournaments. The stacks are 10,000 deep, the blinds increase every 12 minutes, and the prize pool is a guaranteed $20,000. $3000 Mega Micro: This is one of the best low-stakes online poker tournaments out there, with speedy seven-minute blind levels and starting stacks of 5000 chips. It costs just $3 to play, which is great value for a guaranteed cash kitty of $3000. Don’t be put off by the name, for many of 888’s Highroller Series poker tournaments are well within reach for the average Aussie punter. This super collection of real money hold’em events offers a wide spread of gameplay formats, with almost all of them running every day of the week. PokerStars.com is the world’s largest online poker network – a status well and truly reflected in the size and scope of its tournament lobby. It hosts the Australia and New Zealand Tournament Leader Board (ANZTLB), which is now one of the biggest — and most affordable — weekly regional poker leagues on the Web. There’s also the World Championship of Online Poker (WCOOP), the Battle of the Planets sit-and-go leaderboard and the PokerStars MicroMillions, the lattermost of which features minuscule buy-ins and over $5,000,000 in prize cash. 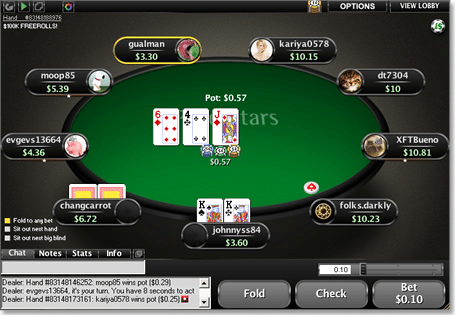 Sunday Majors – PokerStars’ Sunday tournaments are legendary. The Sunday Millions is the richest ongoing poker competition on the Web, with a guaranteed purse of $1,000,000 up for grabs every week. There is also the $500,000 Sunday Warm-Up, the $300,000 Sunday Storm, and the Sunday Billion with 1,000,000,000 play money chips on offer. Saturday Line-Up – There’s a wide range of real money Texas holdem tournaments to choose from every Saturday at PokerStars.com. The low-stakes Saturday Micro and Saturday Splash offer great cash rewards for minimal outlay, while the big spenders can indulge in the $250,000 Saturday Super Knockout tournament. Daily Bigs – If you can’t wait for the weekend, PokerStars also runs a slew of big-money guaranteed events from Monday to Friday. The Big $162 and The Big $55 are the drawcard daily tournaments, each offering $80,000 in cash prizes. Hot Turbos – These high-octane tourneys run alongside the Daily Bigs all week long. Quicker blind levels make for rapid-fire action, while micro-stakes hold’em events with buy-ins as low as $0.55 make the PokerStars Hot Turbos accessible to all kinds of Aussie poker players. Omania – If real money Omaha poker is your game of choice, we highly recommend PokerStars’ Omania series. Buy-ins range from $5.50 up to $33, with just under $30k guaranteed prize cash overall. Game styles include pot limit Omaha (PLO) and no limit Omaha hi/lo (NLO H/L). Spin & Go – This original PokerStars concept allows you to win up to 3000 times your entry fee, thanks to a random prize multiplier which determines the size of the kitty. With six buy-in prices ($1, $3, $7, $15, $30 and $60), three players to a table and ultra-fast blind levels, these sit-and-go games (SNGs) are ideal for players who want big incentives but don’t have the time or patience for traditional multi-table poker tournaments. Escalators – In most poker tourneys, the blind levels remain the same length throughout. In an Escalator poker tournament, however, the blinds become longer as the event progresses. So you might start at Super Turbo blinds of three minutes, with each successive level increasing in length until the maximum (e.g. 15 mins) is reached. Once you hit the top level, the blinds remain fixed until the end of play. Double Chance and Triple Chance – This is a unique take on the popular rebuy format. In a Double Chance poker tournament, your buy-in gets you a special token which can be used at any time to claim an additional sum of chips equal to your starting stack. In a Triple Chance tourney, you get two such tokens. If you bust out and have a token up your sleeve, it will automatically be exchanged for a new stack. Shootouts – Most multi-table poker tournaments shuffle players around to balance the numbers from table to table. In a Shootout event, however, each table continues until all but one player has been eliminated, with the survivors merging to form new tables. The process repeats until there is one master table remaining, from which the ultimate winner will emerge. Flips – This super-fast real money poker comp puts each player all-in by default on every hand. With starting stacks of only 10 chips, these events usually only last a few rounds. Flip tournaments can be played as regular scheduled events, 6-max or full-ring SNG competitions, or Shootouts with as few as two players per table. Rush Poker – Exclusive to www.FullTilt.com, Rush Poker tournaments are about as fast and furious as it gets in the world of real money online hold’em. As soon as you fold out of a hand, you are immediately shifted to a new table and dealt in right away – so there is no waiting around watching others duke it out when you’re not in the action yourself. Alongside all the different types of daily, weekly and monthly online poker tournaments listed above, hold’em players can also compete for serious cash prizes without having to fork over any significant buy-in amount. Freeroll tournaments cost nothing to enter, meaning you can build a real money bankroll without having to even make a deposit at an online poker room. These are extremely popular at 888 Poker, especially with new players looking to take their first strides in tournament play. Satellite tournaments are feeder events which allow the best performers to win entry into bigger, more lucrative tourneys. If you’re good enough, you can join a basement-level poker satellite for just a couple of bucks and play your way to a seat at a million-dollar event. And besides winning through to rich online tourneys, you can also qualify for some of the world’s biggest live poker tournaments. PokerStars satellites have produced a number of high-profile tournament winners, including the 2003 WSOP Main Event champion Chris Moneymaker.